For the second year in a row the WXPN Xponential Festival is offering bike parking at the festival at Wiggins Park in Camden. It's a great reason to bike over the Ben Franklin Bridge. 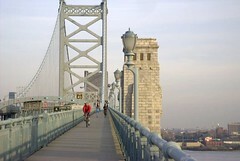 Ben Franklin Bridge South walkway is open from 6AM to 9PM except for Sunday Morning (9:30 AM to 9PM). Bikes are allowed on board for no charge at any time on the RiverLINK ferry, NJ TRANSIT buses and the PATCO High Speed Line.